ABM presents 2 menus with basic equations (for example, 2 Zs in parallel, Fo resonance, XC, XL, Ohms Law&Power, D<>Y converter, Parallel R,L,C, etc.). The program uses menus that are softkey driven. Series Circuit Analysis and Parallel Circuit Analysis extracted from ACDC2 but not using matrix as input device and more user friendly. It includes some extra sections like RC and RL transients. Includes comprehensive PDF documentation. Aimed at Basic Electronics (Series Circuits, Parallel Circuits, Delta Wye Conversion, Wheatstone Bridge, and Thevenin Bridge). The program uses a matrix approach to input the data. Allows you to enter numbers (0 to 255) for each R, G and B and displays the corresponding color over the screen. For example, Red=255, Green=255, Blue=0 will color your screen yellow. Converts coordinates between different systems. For example, it will convert between X=8 Y=6 Z=4 in rectangular and 10 36.87 4 in cylindrical and 10.77 36.87 68.20 in spherical. Yet another converter which when one system is entered(Cart., Cyl. or Sph), the other two system are simultaneously converted and all three system are displayed along with the graph showing the position of each variables on the graph. Handy converter between Degrees, Radians and Gradians. Set the number of digits, enter the position of the resistances or impedances in the network, and then enter the data for the wye network and the delta network, and it will give the result in both rectangular and polar forms. Distance, speed, and time calculator. Enter two of the values and this solves for the missing value. This program is not designed to solve intricate matrix problems, but to facilitate the entry of data in matrices and perform many operations as described in the User Manual chapter 26. Sample of an electrical engineering library. This will be more comprehensive once complex number support is added to the HP Prime solver, but for now it is just a demo of what is to come. Using the solver app, for an ellipse, solves for area, circumference, ellipticity, and eccentricity. 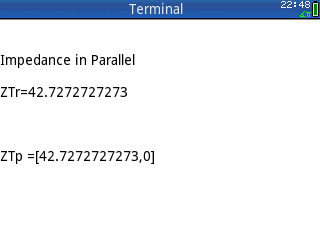 Length of radius 1 and 2 are calculated using the two angles you enter. For an elliptical sector, solves for area, radius 1, and radius 2. 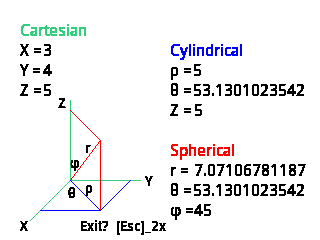 For an elliptical arc, solves for radius 1, radius 2, chord, sector area, and arc area. Converts Degrees, Radian, Gradian, and (X,Y) Coordinates. I can't get it to work, however. A compilation of equations used in Electrical Engineering. The program will pass the "selected topic" to the Prime Solver App. Handles Engineering or Scientific adjustment using the number on the Stack and increases or decreases the exponent EEX simulating <-ENG ENG-> keys. This program is not meant to compete with the more advanced program Casio-Style ENG Button but simply uses a different approach and graphical interface. Extensive library of equations that can be used in a course in Fiber Optics. The variables may vary slightly, but a variable description is provided in each topics before the program is transferred to the Solver. There are a total of ~130 variables all listed with a description. If you are familiar with Prime programming, you can append your own equations to expand the library. This program is aimed at Basic Electronics, and uses a friendly interface to facilitate data entry. 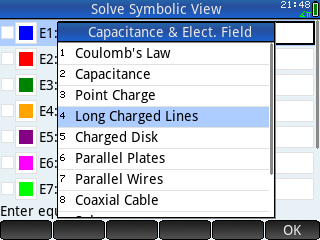 Use the Navigator key to select your option like Series, Parallel, or tap the box beside it twice to check the box. Tp the Freq box, enter a frequency (for example, 12000) then tap box R, RC, RL, LC or RLC twice followed by [OK]. For example, for RLC, enter your values R=200, L=.002, C=2.5 EEX -6, and [OK], and the result will display XL, XC, Zr (Z in Rect. 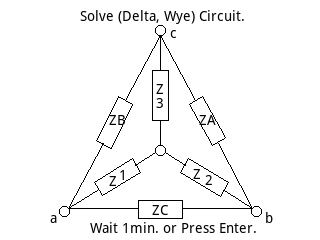 ), Zp (Z in Polar), Yr (Y in Rect.) and Yp (Y in Polar). This program will solve 2, 3, 4 Loop AC and DC circuits with ladder networks. It makes use of matrix M1 and M2 to facilitate entry of real and complex numbers. Uses RREF to solve linear equations, supporting both real and complex numbers. It can also solve larger than 4x4, but the interface is less friendly for this since larger systems are used less frequently in electronics circuits, which this program was designed for. 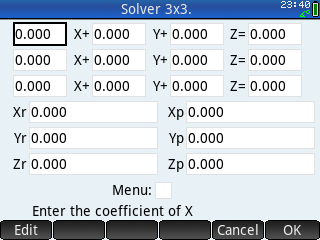 Linear solver app similar to the LSX program, in that it can also solve Complex Linear Equations in 2x2 and 3x3. Useful for those in the Electrical/Electronics field. 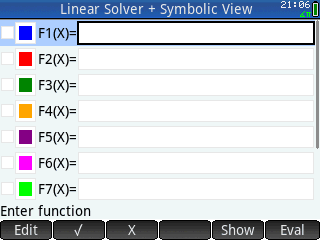 Mimics the Linear Solver APP, however it can also solve Complex Linear Equations in 2x2 and 3x3. Useful for those in the Electrical/Electronics field. This program is used to calculate the impedance of a Surface Microstrip. For example, in the case of Z=~50 ohms, Er=4, W=1.5162 mm, T=0.035 mm, H=0.794 mm, you can enter any 4 values and solve the unknown. 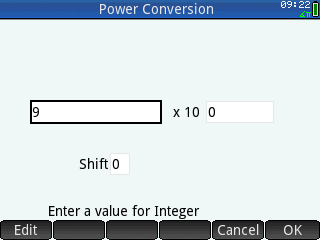 Very simple program to convert Power of Ten units. 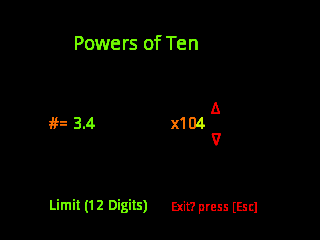 Modified version of Power of Ten, a simple program to convert Power of Ten units, but with a graphical interface after your data is entered. Collection of programs to assist one in programming, containing a group of characters and units which are not available in the editor, which you can copy and paste from the note file to your program. Calculates both series and parallel impedance, and allows you to accumulate resistors by building on prior calculations. Simultaneous linear equation solver which solves 2x2 and 3x3 equations in Real and Complex mode. Mimics HP Linear Solve App, with Inputs and Outputs on the same screen. To return to Menu: Check Menu box and [Ok]. A short program that uses the <Solve App> to Numerically solve Special Product equations. Includes comprehensive PDF documentation. 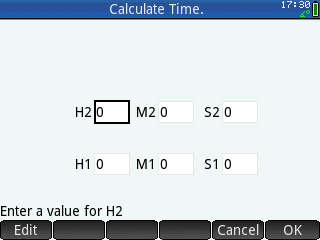 A simple time calculator to add or subtract time in a 24 hour clock.